The Metro Alpin carries mountaineers from Saas-Fee up towards the peaks, to an altitude of nearly 3,500 m. The summit of the mountain is a climb of about two hours from the top station of the funicular. 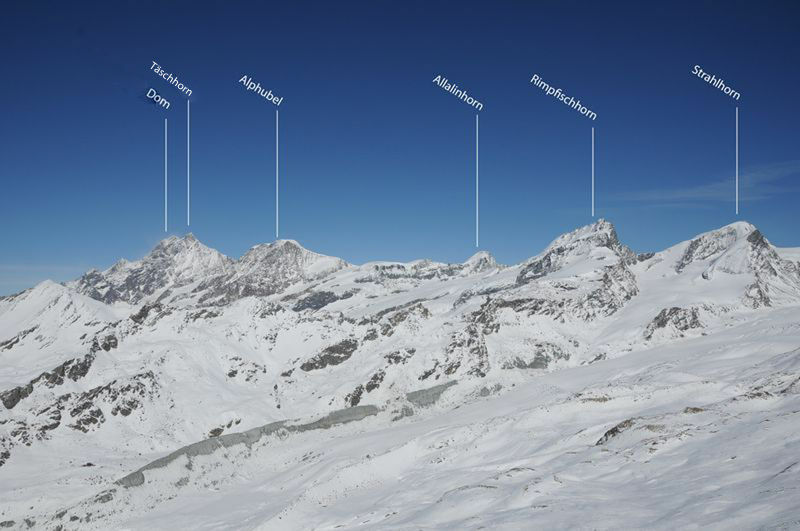 The summit is located on the Mischabel ridge between the Saas and Matter valleys; it is part of the Allalin group, along with the Alphubel, Strahlhorn and Rimpfischhorn. 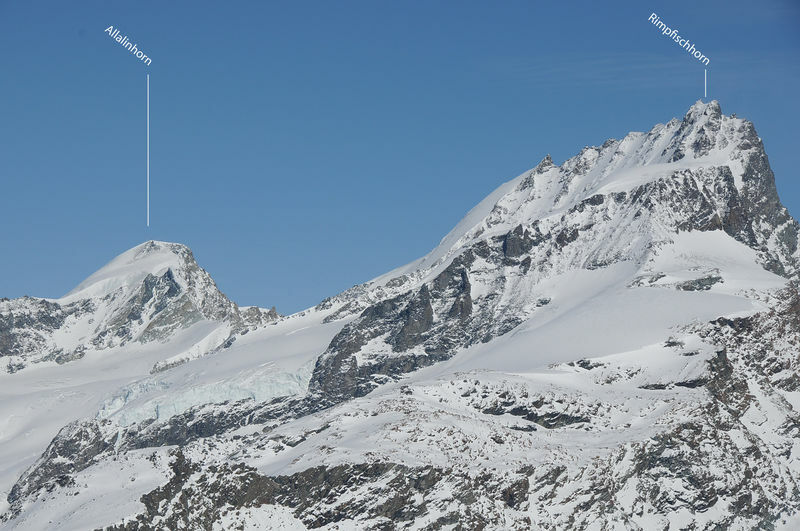 The Allalinhorn is a white dome between the mountaineering centres of Saas-Fee and Zermatt. The mountain guide Camillo Supersaxo from Saas Fee has climbed the Allalinhorn more than 1,000 times. To celebrate the anniversary, Bishop Eldingen said mass on the summit. The name Allalin refers not only to the mountain but also to the area to the east of the summit. The origin of the name is disputed. The emphasis at the end of the word suggests a pre-German origin. On the other hand, the name Allalin led the archaeologist and writer Christian Moritz Engelhardt to his “Saracen hypothesis” in 1840, according to which Saracens in the 10th century left behind a series of names in the Saas valley and as far as the Simplon area. Engelhardt specifies the name as Alalain and traces this back to the Arabic “ala ain” (at the spring). Another explanation comes from the year 1976. The writer Jules Guex cited a letter from Johann Ulrich Hubschmied, which derived the name Allalin from the Celtic “akarnos” (“maple”). A diminutive, “agarinus”, gradually evolved into “agalin”, which means “small maple” in the Valle Verzasca. This became “ayalin” in the Saas valley, which was not yet Germanised, from which Hubschmied constructed the hybrid form “all’ayalin”, later made into Allalin by the Alemannic settlers. This theory, too, is not widely accepted. Without any historical proof, no definitive explanation exists. In 1828, Heinrich Michaelis and a guide crossed the Allalin Pass and thereby opened up the route to the south-west ridge. 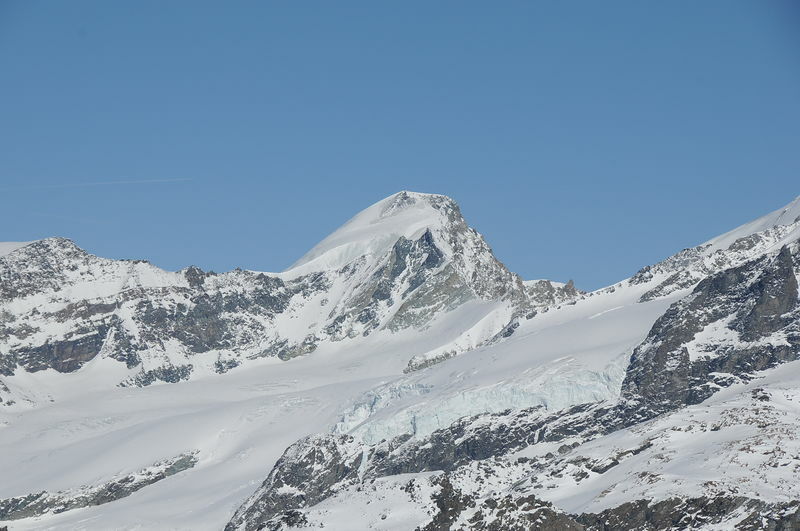 The first ascent of the Allalinhorn via the same ridge only took place 28 years later. On 28 August 1856, the parish priest Johann Josef Imseng from Saas-Grund and his manservant Franz Josef Andenmatten led the Englishman Edward Levi Ames to the summit. Today’s normal route, the north-west ridge, was first used on 1 August 1860 by Franz-Josef Andenmatten, together with Sir Leslie Stephen, F. W. Short, Frederick William Jacomb, C. Fisher, Moritz Anthamatten, Peter Taugwalder and Johann Kronig. The Bernese high school teacher and historian Heinrich Dübi ascended the summit via the difficult north-east ridge on 27 July 1882 with the guides Alphons and Peter Supersaxo, and then descended via the Hohlaubgrat ridge. This represented the first crossing of both ridges. The Hohlaub ridge was conquered as an ascent for the first time five years later, on 12 July 1887, by the Englishmen Harold Ward Topham and C. H. Redall and the guide Aloys Supersaxo. A year earlier, Aloys Supersaxo and the Briton C. A. C. Bowlker were the first to climb the south face, a grade IV climb. The first winter ascent of the Allalin was by the Swiss mountaineer R. Bracken, climbing solo, in 1907. The first ascent on skis was on 17 April of the same year by A. Hurter und Max Stahel, both from Zürich, together with the local mountaineers Othmar and Oskar Supersaxo.